Our experienced service and support staff provides on-site as well as in-store service. We service ALL brands of computer hardware, software and associated peripherals and all makes of laptop and portable computers. 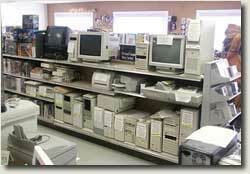 We specialize in older, hard-to-find hardware and software. We sell and REPAIR all computer hardware. Many of our small business customers appreciate our ability to solve a wide range of hardware and software problems in one office visit. Whether it is a network issue, Internet access, computer server, computer virus infection, spyware, other software or hardware problem, we can usually resolve it in one visit. Keeping your business up and running is our highest priority. Because of our business focus on computers and accessories, we do not service or support stand-alone copiers or dedicated FAX equipment. We do support products such as the Apple. HP All-in-One product line, IBM, DELL, Compaq, Toshiba, Sony, E-Machine WinBook, Gateway, HP and others. We are Laptop SPECIALISTS on repairs and parts replacements. We do board level power plug repairs! We have Laptop power adapters, batteries, and keyboards in stock! Check us out! We are DATA RECOVERY experts. Lost a Hard Drive or disk? We may be able to get the data back using the latest Forensic tools available. Avoid the REALLY expensive options and let us try to recover your data FIRST at 'normal' rates and costs. We have a forensics certified expert on staff. We also sell Direcway Satellite Internet and Wireless Broadband Internet access systems. We provide after sale support for our customers. We are certified by Hughes Network Systems and have successfully installed and supported many systems. Hourly rate $90.00 / hour. Remote site rates $90.00 / hour and charge this rate ONE-WAY travel to location.